This year, the Stolpersteine for Therese and Abraham Cohn were layed on 24, Alleestr. and, additionally those for Else and Siegbert Maier on 10, Am Thermalbad. The ceremony started on Wednesday, May 16th, 9.30 o’clock at Allesstr.24. Siegbert Maier was 14 years old when his lifeless body was found next to the body of his mother, Else Maier, on June 14, 1942 in their apartment in Frankfurt. They were brought to the Israeli hospital in Gagernstraße 36. Siegbert died that day. His mother died a day later. “Suicide by sleeping pill-overdose” was determined to be the cause of death according to the officer in charge. The reason for suicide was unknown, they said. 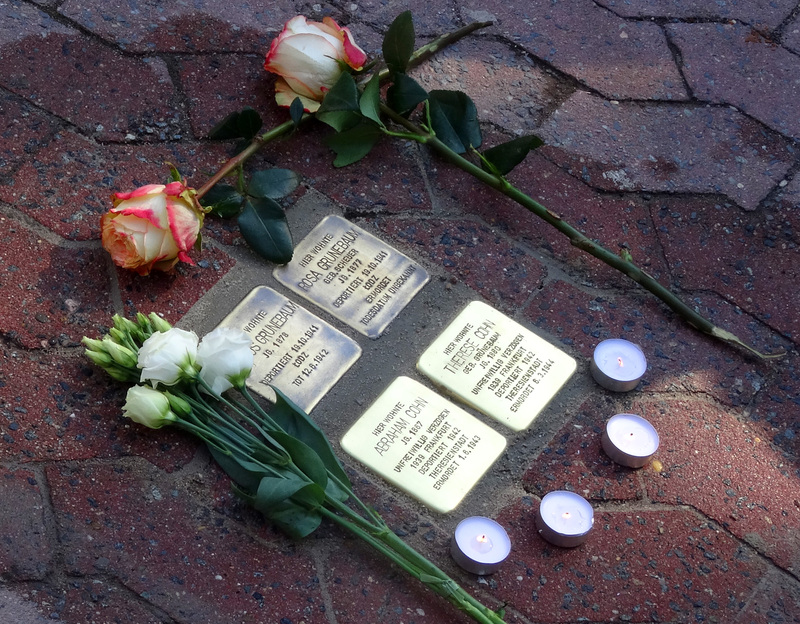 “Humiliated – Disfranchised – Escape to Death” read the Stolpersteins laid by artist Günther Demnig in front of the house in Am Thermalbad 10 (then called Taunusstrasse). This where the Maier family lived. After her father Hugo died of “unknown reasons” in 1935 and the persecution of Jews became worse in Bad Soden (a stronghold of the Nazi party), Elsa and her polio-stricken son moved to Frankfurt in 1936. Life there was also very difficult. The family’s money was seized and access to it was strictly regulated. They did not have enough money for bare necessities. They were allowed to take out just 300 Reichmarks a month for living costs. Anything after that, for instance, 48 Reich marks for her handicapped son’s therapy or 25 Reichmarks for his schooling had to be applied for. When rumors of deportation surface in June 1941, she so no other way out for her and her son. Nicole and Rüdiger Brause from the AG Stolpersteine researched the fate of the Maier family and sponsored their Stolpersteins. Anna Seussler, a student from the Heinrich-von-Kleist Highschool in Eschborn played violin at a small, impressive memorial for these respected citizens that lived here. Else’s mother, Therese Cohn (born Grünebaum) was married to her first husband, Emil Scheuer of Bad Soden, when he committed suicide in 1912. Emil’s father Julius, owner of “Julius Scheuer OHG” and diverse properties, was a wealthy man in town. That is, until 1938 when the Nazis forced the company (then run by Julius’s son-in-law Abraham Cohn) to crumble. The company was not permitted to do business with non-Jews. On Pogrom Night, November 10, 1938, the Cohns’ apartment in Alleestrasse 24 was demolished. Documents were destroyed, and the furniture was damaged or thrown out of the window. Anything valuable, including money, jewellery, silverware and clothing was stolen. Rasa Vilgalys-Hiob related these horrible events with emotion. She had informed herself about the Cohns’ fate. The US citizen and chair of Bad Soden’s Foreign Council, together with her husband Paul Hiob sponsored their Stolpersteins. Abraham was forced to sell all their property in order to pay the “Jewish wealth tax”. With very little money left, he and his wife Therese moved to Lersnerstrasse in 1939. They lived there with their daughter Else and grandson Siegbert who both committed suicide in 1942. They buried their love ones in the Jewish Cemetery in Frankfurt. The Cohns’ fates were soon also sealed. Therese was deported with older citizens on September 1, 1942 to Theresienstadt and Abraham followed the next day. Abraham died in that concentration camp on June 1, 1942. Therese was killed there on March 6, 1944. Two new Stolpersteins in front of Alleestraße 24 are in their memory. Mr. Demnig also re-installed two Stolpersteins from the private property onto the public sidewalk. Paul Florsheim, the grandson of Rosa and Markus Grünebaum, who died in the ghetto Lodz in 1941, had their Stolpersteins originally laid in summer, 2011. Florsheim’s great Grandfather Julius Scheuer built the house Aurora in 1904. Now all four Stolpersteins are on public property. I am delighted that these four persons have been remembered with Stolpersteine. They are in fact the descendants of my great uncle Emil Scheuer who was the brother of Rosa Scheuer – my grandmother who in turn was married to Marcus Grünebaum. I was responsible for placing two Stolpersteine in August 2011 in their memory in front of Villa Aurora which was built by my great grandfather Julius Scheuer in 1905. These two stolpersteine have now been moving next to the recently placed ones. Regretfully I was unable to participate in the ceremony on 16 May. Copyright © 2019 AG STOLPERSTEINE IN BAD SODEN. All Rights Reserved.